A worker's first-hand discovery of how the Socialist Labor Party altered the theories and quotes of Marx, Engels, and Lenin in order to mislead the lower classes into adopting an anarchist program that had already been rejected by Marx and Engels. The details of which theories were falsified, how quotes from the founders of socialism were altered, and what purposes the alterations served. 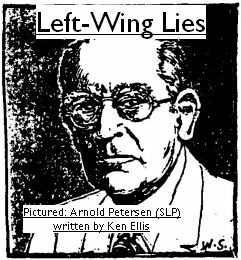 How SLP leaders squelched dissent and civilized discussion through censorship, secrecy, and a bureaucratic Party structure; and how it provides less freedom of speech for its members than the government which they claim to want to abolish. How alienation makes people susceptible to sectarian movements. The organizational structure of the SLP is contrasted with that of the First International Workingmen's Association. The Marxist theory of the state and the Paris Commune are compared to state socialist and anarchist theories. What Marx envisioned for monarchies, republics, and the future. What hasn't worked in Marxism and Leninism. What the lower classes can do before machine labor completely replaces human labor, and lots more. This book hopefully contains the proof that socialism as practiced today by a myriad number of sects, groups and parties, is little better than a pack of lies, and, for that reason, are all worthless to the working classes. They think that just because we are poor, that we must be stupid as well, as though one caused the other, and as though we cannot see through their scam. i didn't know this was here!